Holly S. Blankenship, D.O., knew she wanted to study medicine from the time she started volunteering at local hospitals as a middle school student in Gallatin, Tenn.
What Blankenship never considered was working with or for her father; Dr. James Spurlock, M.D., at the Mountain View Medical Family Practice in Woodbury. Blankenship, who served as the keynote speaker for the annual Cannon County Career Women’s Luncheon Friday (July 27), is the newest member of the medical staff at Stones River Hospital, and she starts at Mountain View Medical seeing patients, Aug. 1. “A lot of people ask me if I’m worried about working with my dad and how the relationship will change or how that will go,” Blankenship said. “Honestly, I would be more nervous if I didn’t know the people I was going to practice with. Blankenship completed her residency for the University Of Tennessee College Of Medicine at Erlanger Hospital in Chattanooga in June. 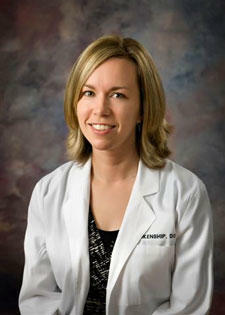 She also attended the Philadelphia College of Osteopathic Medicine, and Samford University. She attended Gallatin High School in Gallatin, Tenn. The aspiring doctor knew medicine was her path prior to reaching Gallatin High School. Blankenship said she looks forward to working with patients in Cannon County and learning the character of the people throughout the area. Congradulations and welcome to Woodbury. I hope you have a long and successful practice in medicine.